(LIMITED SUPPLY LEFT - CALL PRIOR TO ORDERING, THANK YOU!) 176 pages, 11 X 14-1/2. Photographic history of buildings worldwide, hundreds of photographs, many in color. 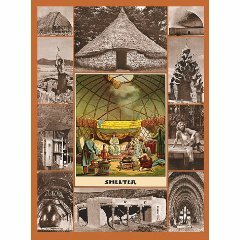 In print since 1973, a best seller which influenced a whole generation of architects and builders and began the strawbale building revolution. Rare remarkable photographs and line drawings.